These are some of my favorite vintage kid’s clothes finds. I keep them hanging up in my craft room for inspiration. It just dawned on me that they’re all perfect Easter outfits! 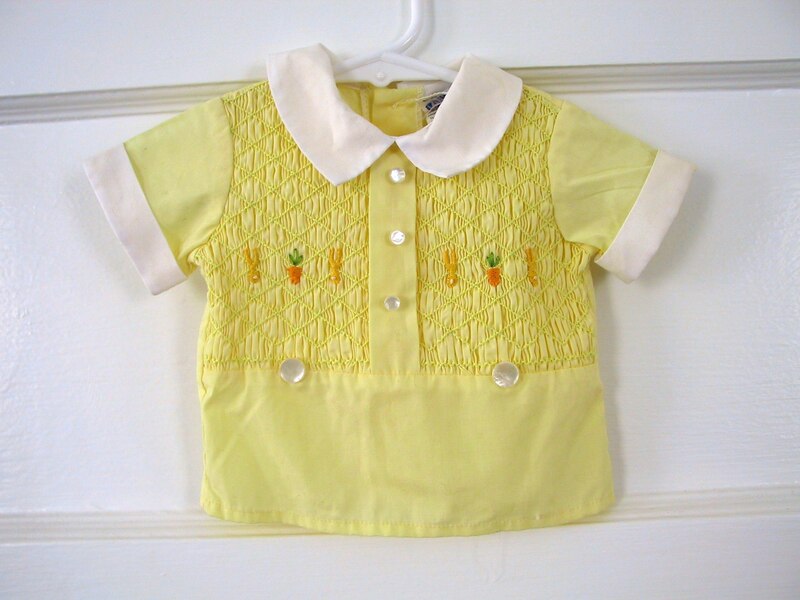 The bunny and carrot smocking on this top is awesome! Wish it came with the bottoms those buttons are for. This is my favorite little baby cardigan. Little lamb intarsia done in super fuzzy soft angora (?) or something. The lamb designs are so dense at first I thought this was a little wool sweater that had been accidentally washed and shrunk up. But I don’t think that’s the case. It must be a larger guage yarn knit on tiny needles? It is still a mystery to me. I’ve tried a few times to recreate the effect and it’s never come out quite right. Maybe because I stink at intarsia/fair isle knitting! Those are too cute! Although, Oscar doesn’t look too happy to be in that cherry dress. Perhaps he’s more of a strawberry boy. The smocked top is so so sweet. I often want to give smocking a go, but alas, I think my little guys would feel just the way Oscar does about the cherry dress. those are darling pieces. 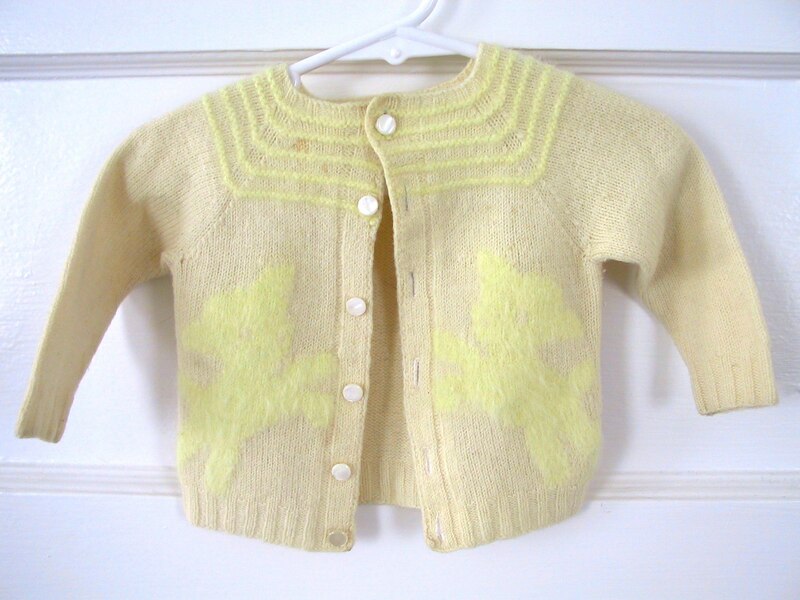 did you sell vintage baby clothing for your store? Oscar doesn’t look impressed with the dress does he, he must know that he shouldn’t be wearing it. It does look gorgeous though and I love the smocking on the bunny top. Beautiful work..
O! Oscar’s expression is just priceless. “Ewwww! Git it off me! Git it off me!” holding it off so it won’t sear his boy skin with all its pink girlyness. Glad to see that Oscar knows what to do with that pink dress. that picture of your son is so cute! we call those future blackmail photos around here!! Oh, seeing those sweet outfits reminds me of my mom’s and my great yard sale finds. I cannot wait for spring to finally arrive so we can go out looking for sweet vintage clothes and fabrics again! Oh Oscar, that is too cute. The poor little guy, he just doesn’t like that at all.